Ski, walking, hiking: There are 3 ski resorts close to the house. Abetone, 30 kms away, is the best in the Appenines with stunning views of Emila and Tuscany. It has an extensive network of slopes mainly for intermediate level skiers. Closer but smaller are Lizzano in Belvedere and Corno alle Scale, both approx. 30-mins drive. Specials deals are available on ski passes. For info, call (0039) (0)534 51052. Some ski equipment (salopettes etc.) is available at the house and can be borrowed with the owner's agreement. The Appennines have an excellent network of marked trails and mountain refuges organised by the Italian Alpine Club which has a main branch in Bologna (0039) 051 234 856. A recognised national footpath passes by the house and takes walkers to as high as 1441m to mountain ridges offering stunning panoramic views of the Appenines, Emilia and Tuscany. From one local peak, visitors can see both coasts of Italy and as far as Mont Blanc! Food and drink: Emilia Romagna is Italy's finest culinary region, home of balsamic vinegar, parmesan cheese and parma ham and Tuscany is renown for its fantastic wine, making this house perfectly placed for foodies. Maresca, 20 mins away, has a top-class restaurant listed in Italian best-food guides, which serves seasonal, delicious and very reasonable local food and wine. Carmignano, less than 30 mins from the house, is known for wines that marry Sangiovese, Canaiolo and Cabernet grapes (as well as local olive oil and grappa) and wine tasting are available in lots of local vineyards. Excellent wine can also be found in all local enoteche (specialist wine bars). Because of the area's superb culinary traditions, there are a profusion of food festivals (sagre) all year round, ranging from chestnut sagre to the famous white truffle sagre, held in Marradi, about 1hr from the house, in Autumn. In the summer local sagre in near-by villages include polenta, wild boar, venison and ravioli. Festivals and markets: The area is home to many music festivals in the summer, including Italy's best blues and jazz festivals. Pistoia holds the world famous Pistoia Blues festival every July, as well as the Giostra dell Orto, a jousting medieval processing also held in the Summer. Porretta holds the Porretta Jazz festivals each summer, with past guests including the likes of Buddy Guy. Many local towns also throw medieval parties in the summer - joisting, parades, processions - and Prato has an annual national Comic Book Conference in the spring and Prato Estate (July/August) is a living arts festival including open-air theatre, concerts and films held each year. Nearby San Miniato is home to antique and craft festivals on the third and first Sundays of every month. An antique market, often including a stall selling only fascist memorabilia to the strains of military music, as well as antiques and paintings, is held every Sunday in Pracchia's town square (15-minute drive). Wild swimming: there are a profusion of wild swimming options close to the house, including streams, waterfalls and plunge pools in the woods surrounding the house and, five minutes' away, a large river (Reno) with small peddly beaches along its shores. A lake half an hour away has small beaches, pedalos, cafes and sail boats for hire. I lived in Emilia Romagna after leaving school and then again while studying Italian at university. I have 3 children who love the house and the surrounding woods. There are fairies there, as they will tell you! I have travelled every region of Italy but always come back to Emilia Romagna for its wonderful food, warm and welcoming people, history and lack of tourists. For me it is the epitome of everything I love about Italy. This house is in a small village where the partisans hid out. The views are stunning, the night skies are filled with stars and the screeching of owls and a stay there is pure medicine for the soul. utter peace and quiet. Not a tourist in sight. Excellent wild swimming in nearby lakes, rivers and waterfalls, fantastic foraging opportunities, tree house! The house is heated using a wood-burning stove, an open fire in the kitchen and, for cold snaps, there is a small radiator. The kitchen retains its original stone stove and open fire. It has a 4-ring stove, fridge freezer, grill, oven and kettle. It is basic but well-stocked with a large table sitting 8.
a large number of toys and games for children and teenagers. there's a tree house in the woods! there are sun beds stored in the wine cellar and plenty of space to relax. There is a table and chairs in the shade of a large walnut tree. there are 2 sun loungers which can be put on the terrace which has stunning mountain views. There are 3 ski resorts close to the house. Abetone, 30 kms away, is the best in the Appenines with stunning views of Emila and Tuscany. Absolutely delightful. This is the second time we've been, returning this year with more people, including 10-and 12-year-olds who were in heaven, able to clamber freely through the woods. Whenever I'm stressed now I imagine myself back on the terrace listening to the sound of the breeze in the treetops. The fact that the railway line is almost back in full working order is a big plus. It's so lovely to know that our special place is special for other families too and we look forward to welcoming you all back again soon. We had a fantastic time here - eating dinner in the garden under the stars, wandering around the pretty little village, learning about the rich partisan history of the area from locals in the know. The owners gave us a detailed description of the route and it wasn't hard to find. The property was clean and well-maintained. The house feels cosy and welcoming and the views are gorgeous (and there’s an amazing new treehouse in the garden). There's a beautiful man-made lake a 20-minute drive away – perfect for a day out with the kids. Some excellent local restaurants are also easily accessible by car. Not to mention the fabulous local produce and the thermal baths found in nearby Porretta di Terme. The charming medieval town of Lucca is a 30-min drive across the Tuscan border. If you're looking for a tranquil hideaway far from the madd(en)ing crowds, Casa Castagna is for you. We had never been to this region before but will definitely be back. I feel very grateful to the owner for showing us the unique corner of Italy. I'm so glad those who stay at Casa Castagna are so positive about the house. it is our second home and we love it too! The tree house is almost finished (just needs a ladder) and then the kids will have even more reason to explore the woods, leaving the grown-ups to enjoy the views..
Torniamo ogni anno, più o meno per una settimana, in questa casetta che sembra uscire direttamente dal mondo delle fiabe. Il borgo è bellissimo, caratteristico, con tutte queste abitazioni in pietra e un panorama da spezzare il fiato. La casa è accogliente, non così grande ma ha tutto quello di cui si può aver bisogno: tre camere, un bagno, una cucina, un salottino ed un bagno ed è veramente tenuta benissimo...è riuscita subito a conquistarci e ogni anno ci torniamo con gioia! Il posto è perfetto per rilassarsi, passare un po' di giorni "fuori dal mondo", senza traffico, senza confusione... ed è adatto a tutti: per una settimana tra amici o in famiglia! La signora che gestisce la casa, Candida è veramente gentile e disponibile e offre tutte le informazioni cui si può aver bisogno! Raccomandato altamente, noi già non vediamo l'ora di tornarci.. e ormai manca poco! Silvia and her group of friends visit every new year and have done so for years. I offer a 10% discount for returning guests. It's wonderful to know that Italians find the house an enchanting as us foreigners! 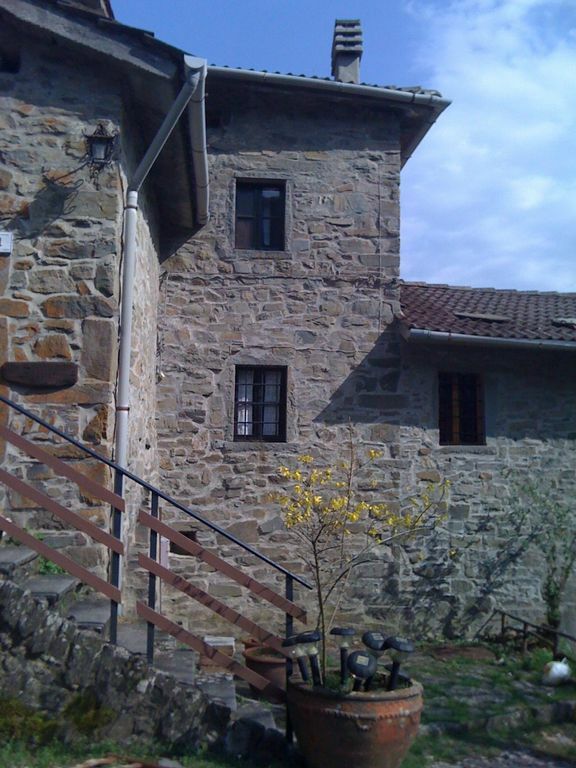 Old charming house in a small idyllic village with very nice people in the middle of the mountains. Have enjoyed our stay with kids and dogs very much! Especially recommendable for hikers and nature lovers: lots of fauna around - we have seen snakes, scorpions, deer, pheasant, weasel, fat dormouse and many porcupine dens. Thank you for your lovely review, Christian. The neighbours contacted me after you left to say what a pleasure it was to have you as guests in the village and they hope you'll come again. I've never seen a weasel, but we are regularly visited by badgers and eagles! Perfect for visiting Tuscany or Emilia, the house is in a quiet mountain hamlet on the Emilia/Tuscany border, 1hr or less from Florence, Bologna, Lucca and Pisa. The house is surrounded by a large private woodland and is ideal for adventurous people who want to walk, explore, build log fires in the evening and hear very little other than bird song, woodpeckers, owls and the odd wild boar. It is an ideal location for mountain walking and for wild swimming in lakes, streams, rivers and numerous waterfalls. The woods have many attractions including a tree house with a view and an abandoned village. Great for adventurous children! It is perfect for foragers on the hunt for porcini and chestnuts or for flora and fauna enthusiasts. The stars at night are brilliantly bright. The nearest airports are Florence, Bologna and Pisa, all roughly 1hr away, (Bologna Forli 2hrs). The quiet spa town of Porretta Terme, with restaurants bars and a health complex, is 20 mins away. Less than 5kms from the house are local shops, a train station and several pretty Tuscan villages with banks, small hotels, restaurants, bars etc. It is a comfortable family home and not for those looking for hotel-standard luxury. The 1km road to the house from the main road up the mountain is steep. Weekend breaks are subject to availability at a daily rate of £100, £90 or £80 (high season, mid season and low season). We will try to accommodate you however long or short your stay. A returnable deposit may be requested. Prices include fresh towels and linen, all bills, firewood.